05.03.2011 - "The town of Badante woman"
A town without women. The men look after the children, cook, do the washing and… wait for money from their wives who work abroad. The Bulgarian town of Varshets is the site of a staggering social experiment. Many of its women work as “badante” in Italy, taking care of the old and the sick. The social structure of Varshets is changing and the transformations – some dramatic, others humorous – are everywhere: in the pubs, in the families, in the local brass band… And at the bus station, where once a year the women arrive for holidays. 06.03.2011 - "Village without woman"
In Southwest Serbia, atop a mountain and four kilometers from the nearest road, the Jankovic brothers hold down the fort in the womanless village of Zabrdje. Dragan, Zoran, and Rodoljub, along with their neighbor, Velimir, represent the entire population of what was once a vibrant rural community. They live in tough conditions. No running water, no roads, not even a hint of a woman’s touch. Not to mention, the three brothers still share the same bedroom. Zoran, the eldest brother, dreams of marrying a woman capable of handling life in Zabrdje. Despite his efforts, he fails to convince a Serbian woman to join them in village. Zoran's friend Danko succeeded in finding a gorgeous wife by crossing the border to Albania. As Zoran sees their unlikely relationship blossom into love, he decides to follow suit. For Zoran, Albania is the only place left to find a bride. Rodoljub, the youngest of the brothers, systematically opposes bringing an Albanian woman into their home. With the war wounds from Kosovo still present, Serbs and Albanians are far from healed. Zoran has the opportunity to extend the olive branch to the "enemy". Will Zoran's attempt be fruitful? Can he fulfill his dream and renew hope in his village? Late Home is a film about two women who live in a home for elderly people and who, against all circumstances of hardship and loneliness, have kept in their souls the good spirit and strive for life. One of the first shopping malls in Sofia could be seen through the windows of the Home, which is situated in the former elite quarter from socialist times Zone B-5. In the dynamic and lustrous space of the mall hardly anyone seems to care that only few steps away some people are living the winters of their lives. Talented people like artists or writers who stayed have one choice only: work as seamstresses. Eriela, Beti and Vesna are seamstresses in the small town of Stip. If they wanted to afford one of their handmade blouses, it would cost them a months salary. While the women are fully employed, their men are less fortunate and find themselves unemployed after the collapse of communism. A situation with a lot of potential conflicts for the couples. The men find it hard to be dependent financially on their women. The Seamstresses (documentary film 30')- Trailer from Dream Factory Macedonia on Vimeo. Exhibition of the photographs made by the students from the University of audiovisual arts ESRA and the Institute of Gender Studies at the Faculty of Philosphy from Skopje. 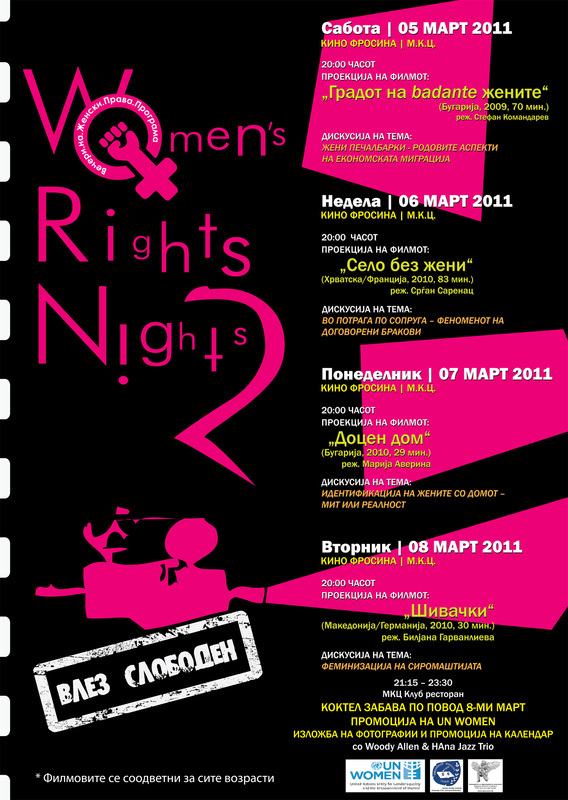 Promotion of the new Entity for Gender Equality and the Emprowment of Women (UN Women) and a coctail for the celebration of the International Women's Day - 8th March with Woody Allen and HAna JAzz Trio.